On 22 September 2016 at 12.00, Human Rights Council President H.E. 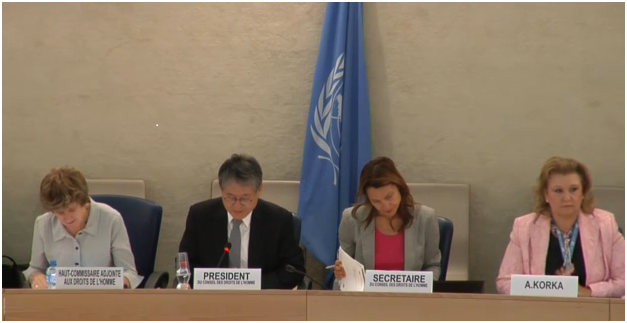 Mr. Choi Kyong-lim chaired the panel on “Youth and Human Rights”. The panel was approved through resolution / HRC / 32 / L.1 during the Council’s 32nd session on 30 June 2016. The resolution was recommended by El Salvador on behalf of a core-group of Member States and it was approved by consensus. The passage marked a historic achievement that recognized youth as subject partners for development, bearers of new ideals and catalysts of action. The resolution provided for the convening of a panel whose aim was to identify the challenges, good practices and lessons learned in the exercise of human rights on the part of young people, as an important opportunity for the empowerment of their rights. – Ms. Yvonne Matuturu, Head of the Social and Human Sciences Section, Multisectoral UNESCO Regional Office for Central Africa, Cameroon. The panel began with a video statement made by Mr. Ahmad Alhendawi, the United Nations Secretary-General’s Envoy on Youth, who welcomed the adoption of the resolution as an important opportunity to address this theme to the Human Rights Council in a systematic and significant way. 5. The involvement of young people in consultations and giving attention to recommendations that the Member States should submit in the Universal Periodic Review. Ms. Maria D’Onofrio, Representative of VIDES International, an international network of volunteers association discussed the importance of involving youth in human rights-based policy making and interventions. The realization of economic, social and cultural rights is a necessary precondition for young people to become promoters of human rights and for their participation in political and civil life. Access to quality education is also one of the greatest challenges as well as active participation, which ensures that the opinion of young people is taken into account and that their participation is trans-formative of the status quo. The last panelist to speak was Ms. Yvonne Matuturu, Head of the Social and Human Sciences Section, Multisectoral UNESCO Regional Office for Central Africa, Cameroon who focused her attention on the plight of youth in the African continent. The biggest challenges are connected to three factors: poverty, climate change and ethnic and religious conflicts. Many countries are in a situation of political change, in a process of democratization and young people are at risk of violence and murder, particularly during pre- and post-election periods. UNESCO considers youth as bearers of interest in knowledge in specific sectors, and she also emphasized the need for investments, policies and strategies to create a favorable environment for youth to be promoters of human rights, citizenship and change in African countries. Following the panelist statements, over 25 Member States as well as Australia’s human rights institution and four NGOs made oral statements to the panelists. The Member States asked the panelists for best practices on integrating youth rights within existing legal frameworks. The panelists were given the opportunity to provide responses to Member States’ questions and gave their concluding statements at the end of the three hour panel discussion. The participation of Maria D’Onofrio and Simon – Pierre Escudero as panelists demonstrates the substantial contribution that IIMA and VIDES has provided to this important topic at the UN. Over the past few years, IIMA and VIDES have been focusing on the central theme that empowering youth in the promotion and protection of human rights is not only good for them but also for society as a whole. A summary report of the panel discussion will be prepared as a result of the meeting of the Council and the Office of the High Commissioner for Human Rights (OHCHR) will prepare a report on the debate that will submit to the Council for Human Rights in its 35th session (June 2017).